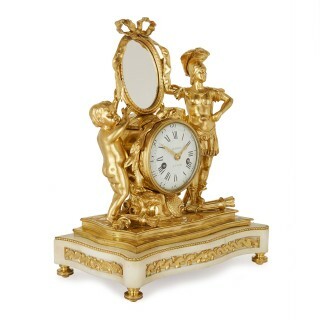 This endearing French mantel clock combines lustrous ormolu and sumptuous white marble, making for a light and yet majestic work that perfectly compliments the masterfully executed Neoclassical design. 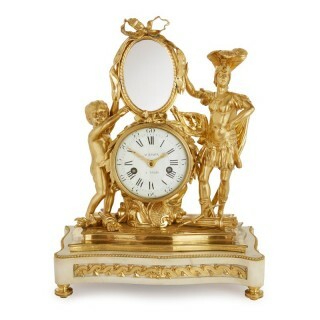 The clock features the full-length ormolu figures of a decorated, uniformed Roman soldier and a small child, who stand with sheaths of wheat about their feet, and hold an oval mirror surmounted with a bow. 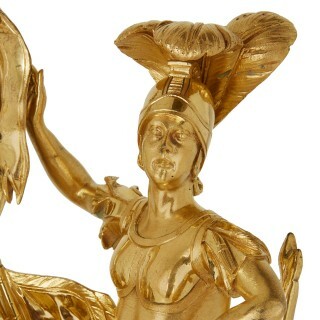 The mirror is set atop the central, circular clock dial, which is mounted around its edge with laurel leaves and a bow. 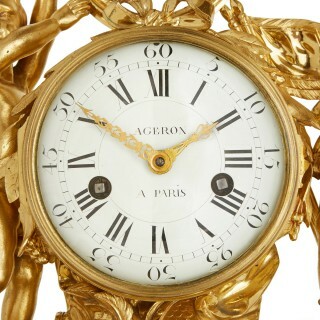 The clock dial features a white enamel face with Roman numerals and outer Arabic numerals, and bears the signature ‘Ageron / A Paris’. The clock dial and figures are set onto curved, rectangular form ormolu steps, which are mounted onto a white marble base. The base is beaded with ormolu around the edges and features a frontal ormolu frieze of wave forms, all standing on four ormolu toupie feet.